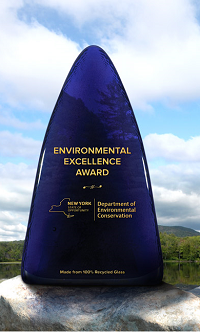 DEC is now accepting applications for the 2019 Environmental Excellence Awards program. The Environmental Excellence Awards recognize businesses, institutions, municipalities, and organizations for outstanding commitments to environmental sustainability, social responsibility, and economic viability. To date, New York has honored 92 committed organizations that are leading by example and inspiring their industries and communities. Businesses (i.e., small, medium, and large businesses, manufacturing, power generation, retail, agri-business, renewable energy, hospitality, sports, etc. ); not-for-profit organizations; academic, health care, and recreational facilities; individuals; and local, state, federal, and Indian Nation government agencies are all eligible to apply. supporting creative urban forestry or farming practices, including programs to advance "farm to table." You must submit completed applications for the 2019 awards by Wednesday, April 17, 2019. DEC will honor winners at an awards ceremony in November. At that time, winners will have an opportunity to present and display information about their award-winning project or program. Visit DEC's website for more information about the program and for application materials.